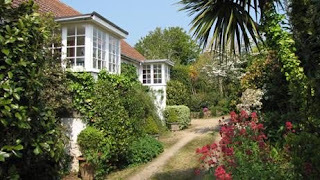 Les Merriennes is close to the beautiful south coast and its safe cliff paths. It is ideally situated for those seeking their base in a quiet and secluded part of the island. The cottages (a barn conversion) are set in what was a farm overlooking tree bordered fields and are well back from a very quiet lane. The cottages are fully furnished and equipped with cutlery, linen (except beach towels), bedding, colour TV and bedside radio/clock. Each cottage has its own sheltered garden for the exclusive use of the visitors (deck chairs, barbecue and table provided) and its own parking space. Petit Bot Bay, one of Guernsey's most attractive and sheltered sandy beaches, is within reasonable walking distance.